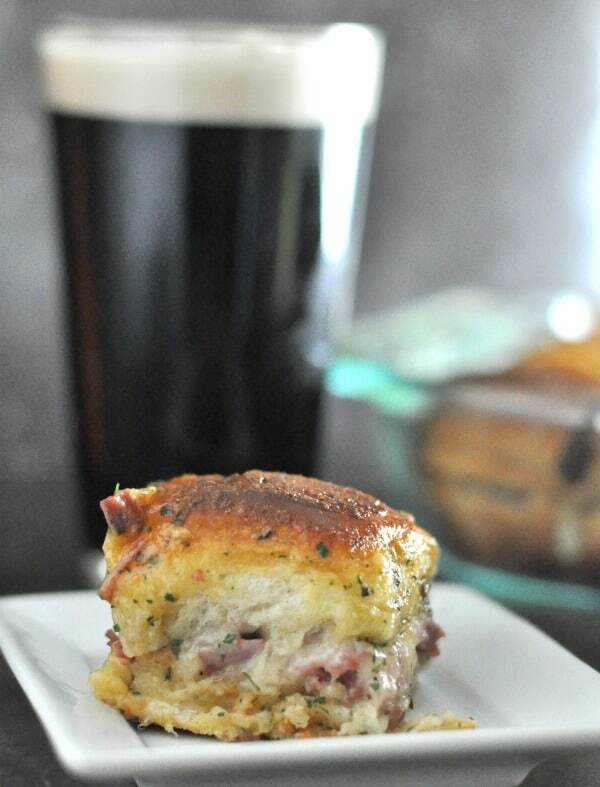 These mini sandwiches are a twist on the classic corned beef sandwich. 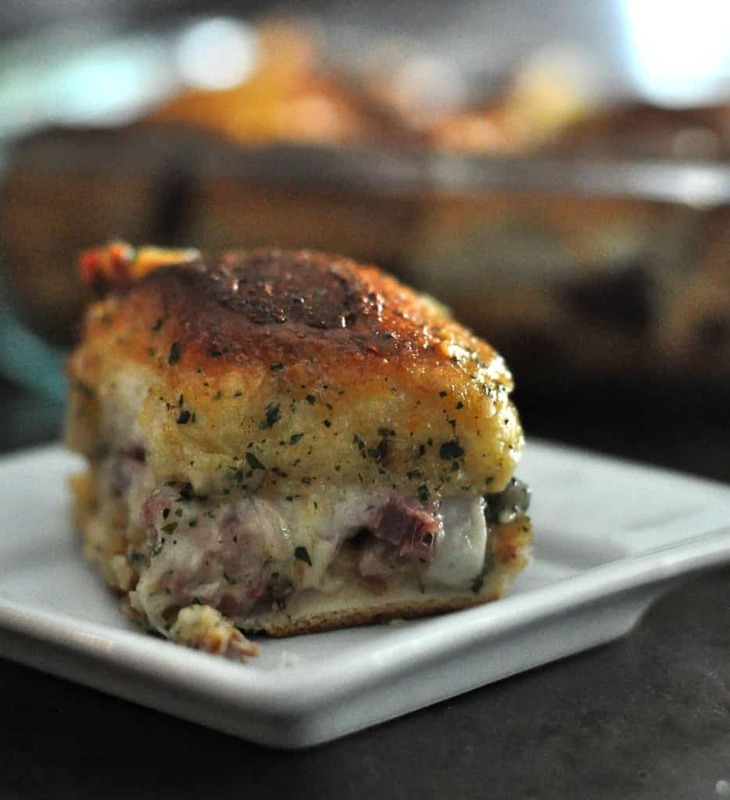 Baked Reuben Sandwiches are a super simple easy appetizer that will completely wow your friends and family. 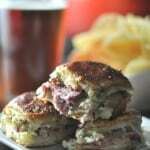 The sandwiches are oven-baked and filled with corned beef, swiss cheese, sauerkraut, thousand island dressing. And did I say, easy? 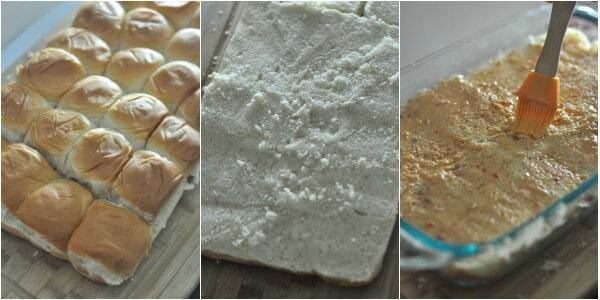 Seriously, anyone can make these simple, mouth-watering, buttery sandwiches. 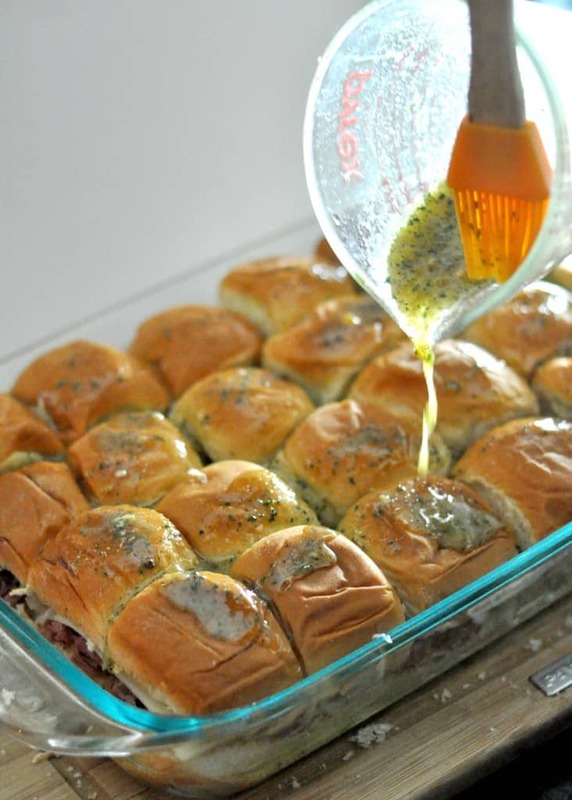 I promised you an easy appetizer recipe and that is what I’m going to give you, friends! Ok, check out the photo above. I buy a 24-pack of Hawaiian rolls and just cut the tops off so there is a large bottom of the rolls. I put the bottoms in a greased 9×13 pan and then spread thousand island dressing on the bread. Then I add cooked and chopped corned beef. I like to chop up the meat for these sandwiches because it makes it easier to grab and eat, perfect for potlucks and tailgating, right? Wait, you say. You don’t have time to make a corned beef? No problem. The deli at your local grocery has corned beef in the deli case, ask them for 8-10 ounces. 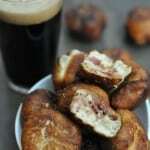 Want to make a corned beef? 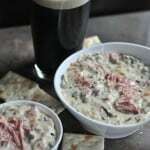 I have simple instructions in my Corned Beef Wild Rice Soup recipe. Once you have the corned beef added to the sandwiches, top with swiss cheese and sauerkraut. Put the bun tops back on and then it is time for the magic ranch buttery sauce. Magical right? This buttery sauce gives the sandwiches their incredible flavor and gets the bun tops nice and browned. I make my butter sauce in a pyrex measuring cup and pour it right over and brush with a pastry brush. Put these in the oven and it does all the work for you! Bake 15 minutes covered with tin foil and 15 minutes uncovered and then you are ready to get these sandwiches in your mouth. Simple, right? How do I know so much about easy and incredible baked sandwiches? Well, one of my readers recently called me, the “Queen of Baked Sandwiches.” I’ll totally own that title. 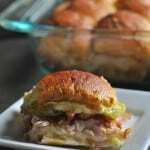 Some of the most popular recipes on Dining with Alice are baked sandwiches, like my Baked Ham Sandwiches, Baked Roast Beef Sandwiches and my Baked Cuban Sandwiches. Potluck: These sandwiches are always a hit, I never leave with leftovers. I’m always asked for the recipe! Tailgating: These sandwiches are great to pair with beers before a big game. 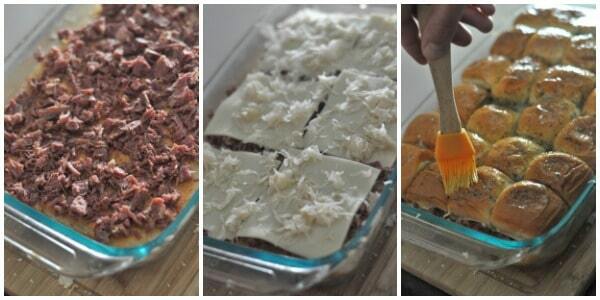 Prepare the Baked Reuben Sandwiches in a disposable container and you can just toss it before the game. 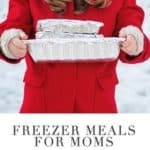 Family Meals: This is a favorite for big family get-togethers, if you are making it for a weeknight meal and want to reduce the butter, just cut the butter amount in half and only mix in 1 tsp ranch seasoning. These easy appetizers are so simple to prepare and always are the hit at a party or family events. What are you waiting for? 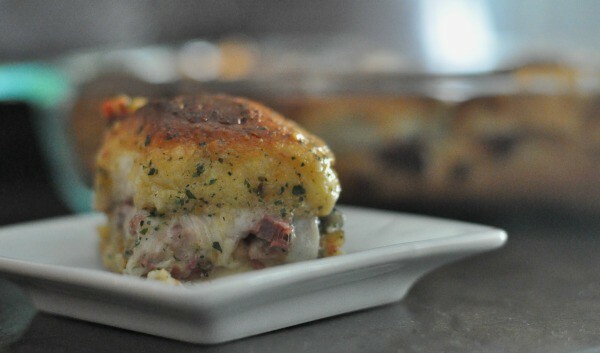 Get these Baked Reuben Sandwiches cooking now! Evenly cut the tops off the rolls. Set the tops aside. 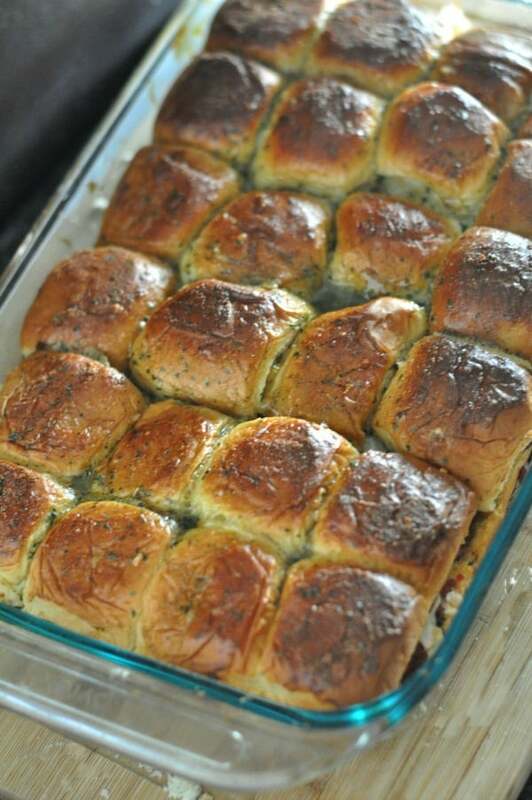 Place the bottoms of the rolls in a greased 9x13 pan. Brush ¼ cup of Thousand Island Dressing on the rolls you placed in the 9x13 pan. Distribute the cooked and chopped corned beef on top of the dressing. Then add the sliced cheese and sauerkraut. In a microwave-safe dish, melt the butter. Add the dry ranch dip and 1 TB Thousand Island Dressing. Whisk and then evenly pour over the rolls or brush with a pastry brush. 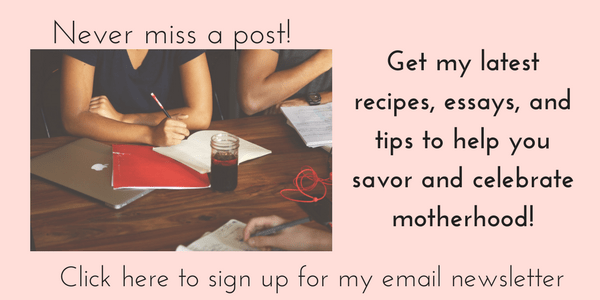 This entry was posted in Appetizers, Weeknight Meals and tagged Corned Beef, Potluck, sandwiches, St. Patrick's Day, tailgating by Alice Seuffert. Bookmark the permalink. Wow, these looks like something my family would die for! 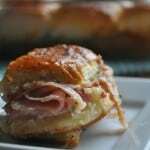 They are obsessed with those Hawaiian sweet rolls, and reubens are by far one of their favorite sandwiches I make. Can’t wait to try this one out at home and see how big of a hit it is! Thanks so much for sharing! Really want to get some more sauerkraut into their diets too!